You don’t get fat by eating fat; you get fat through a high sugar/carbohydrate diet that disrupts insulin. Also another myth is that it is a good thing to speed up your metabolism to lose weight. This is like having the engine idle running too fast. People with an over-active thyroid can’t put weight on because their metabolism is running too fast. Eventually you burn out and the body succumbs to excessive oxidation. The same applies to excessive exercise. 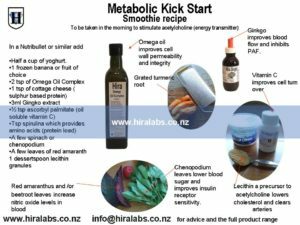 What you need to do is to improve the efficiency of your metabolism thereby not exhausting your adrenals and damaging the thyroid. Tune down the idle and still lose weight. ‘Reduced fat and frequent use of low caloric food product have been associated with a paradoxical increase in obesity’ Heini and Weinsier AMERICAN JOURNAL OF MEDICINE. There is a huge amount of misinformation about the evils of saturated animal fats and full cream milk. Just remember the more processed it is the worse it is for you.Fats like olive oil, butter and coconut seem to be safe for human consumption. Remember polyunsaturated oils that are used for frying produce transfats so they simply should not be used. Coconut oil goes through a different biochemical pathway that doesn’t stimulate excess insulin production. I tend to be wary of anything that clams to be ‘Fat Free’ ‘Low calorie’ ‘Sugar Free’ as these products invariably will have undergone additional and excessive processing to improve palatability. Also be aware that most processed foods contain corn based fructose a ‘sugar’ that will play havoc with the insulin response something you do not want if you are serious about your health. Avoid the use of any vegetable oils like canola, sunflower, safflower, cotton seed, soya. ( rice bran is OK provided it is stored only in glass or tin) These “Franken-fats” are prone to rancidity causing mutagenic changes damaging DNA leading to cancers and arterial plaques. They are present in nearly all packaged foods biscuits cereals. Swap the above with saturated fats ( saturated fats do not inhibit insulin binding, or interfere with enzyme functions like vegetable oils) Saturated fats are also used by the body to fight viruses. Fats are a slow burning fuel (ketogenic)curbing appetite. Saturated fats come from grass fed meats and dairy products. They protect omega 3 oils in the body and do not oxidise to dangerous by-products the way polyunsaturated fats do. Increase your intake of fish like salmon and wild game meats for the omega oil and protein content. Fry with butter, olive oil, duck or free range poultry fat (used by the French, known for their low incidence of heart disease and weight issues). Taking a tsp daily of inexpensive lecithin will help ensure cholesterol is at the correct level. It acts as an oil surfactant and will stimulate acetylcholine which will give you energy. Avoid at all costs margarine, please if nothing else. Even the ones with olive oil. Drink full cream milk preferably raw. There are now many farm-gate sellers of raw milk popping up over the country. They have very strict regulations imposed on them with respect to hygiene, and how much can be purchased at time. I buy full cream, milk and yoghurt from a licenced farmgate supplier. Avoid combining proteins and fats with large quantities of starches and sugars. Slow down insulin and leptin (top metabolic hormone) reactivity by reducing carbohydrate and sugar consumption and taking omega oils, and. Leptin is a recently discovered hormone responsible for weight maintenance. Increase vitamin D levels by regularly exposing your skin to sun when ambient temperatures are below 18 deg. Also take a tsp of cod liver oil daily along with plant based omega oils. (this regime is better than any sunscreen to protect you from skin cancer). Increase your intake of green leafy vegetables. Eat them with a blob of butter which will further enhance the uptake of oil soluble vitamins and nutrients. Growing these yourself is immensely satisfying. Make sure you get heritage seeds and allow some to set seed and then share with your neighbours. Don’t further line the pockets of multinational agricultural companies. Some experts say avoid all fruits( apples, oranges, peaches etc) except berries. Maybe,- maybe not but I am inclined to think that any foods the individual can grow and cook themselves, are more than likely to be safe to eat. Any information with respect to this should be looked at and measured against who benefits? Food giants really are only interested their profit margins, not a nation’s health. Incidentally tree ripened fruit are alkalinising (good thing). Ten minutes before meals drink half a glass of water with a tsp of lemon juice or apple cider vinegar to prepare the stomach for digestion. Also alkalinising. If you are really serious about losing weight, cut out all forms of sugar and sweeteners for a month. Avoid all artificial sweeteners which originated from experimenters tasting the chemicals used in manufacturing pesticides. Besides being a poison’ trick the body into a false insulin response. Take gingko extract 2ml daily to prevent peroxidation of fats around our cells, improve blood supply and oxygen to muscles. Gingko thins blood by reducing the sticking together of platelets. This herb is used in treating early stages of Alzheimer’s. Take additional vitamin C supplements will act as an anti-oxidant as well as helping with collagen production and to improve skin and hair quality. Above all go back to basics avoid processed foods. Read labels. Question manufacturers about what sort of ‘sugar’ is in their product. I have done that and quite a few could not tell me if it had cane sugar or a corn based fructose. I doubt that manufacturers have to state what sort of ‘natural’ sweeter they use.